This Juniper was dug from a friend’s garden two years ago and it struggled to get to grips with life in a pot. The main reason could be that there is quite a bit of rot at the base of the tree and the live vein is quite narrow at that point. The main focus was to strengthen the roots through Proper soil maintenance, fertilising and having a disciplined approach to watering. As most of the branches were leaning towards the left, it was an easy decision to let the flow all go to that side. A few more weak branches were cut and jinned. This job took about two hours with the help of a knife and a Dremel. The tree was left overnight and lime sulphur applied the following day. Wiring was applied on the right hand side to enable those branches to be twisted to the left. The tree will now rest and be planted in a very shallow slab, tapering to the left as well. The base will be planted to the far right of the pot. Until then, fertiliser will be applied and the tree will be placed in full sun to maximise growth. Fine wiring will come later during winter. I do believe in little bits more often, rather than doing a lot of work in one go and risking the health of the tree. The windswept style of Bonsai tells a story of a tree exposed to strong prevailing winds, either in an open exposed environment or exposed on a cliff. Nothing tells the story better than trees in nature. They now received a light summer prune. I also do think that they can both do with a slight orientation change at the next repot. This could be the new orientation or they can both be turned a bit further to increase the depth perception. Simplicity is the goal in every art. What does this mean for Bonsai? Bonsai in its simplest form is a tree in a pot that resembles an old tree in nature. That then probably takes us back to the original design concepts as proposed by Chinese and Japanese scholars and masters from the beginning to today. My own opinion is that the strictness of the original, especially Japanese rules, have been watered down over the years as Bonsai art started to spread to other parts of the world since World War II. Western ideas of what art looks like and what it should be as the individual philosophies of artists as well as the type of Bonsai material that they can work on has shaped this over time. Simplicity can also refer to the horticultural side of keeping trees alive. It comes down to water, nutrients, climate, inclusive of light requirements. Yes, it is that simple, but take any one of these for granted and you end up with a deteriorating or dead tree. From a design perspective it is important to know something about the different styles or forms of Bonsai and by then adhering to the style “rules” in its purist form, simplicity in design will be shown. Part of this is to follow the basic shape and growth pattern of the original tree if it comes from nature or has been in a pot for a long time. Radically changing the shape or form of a tree away from its natural flow, can not only stress the tree, but also lead to a quite complicated design that might need constant maintenance or interference to keep it in that shape. This means that the tree is kept under stress for a longer period of time. A tree that does not show these characteristics or one that can be shaped from seedling or cutting stage will be easier to shape and still adhere to the concept of simplicity. What does this look like? Establish a flared, radial root system growing from a wider buttress and is exposed at soil level. From here a gradually tapering trunk will grow depending on the style. The first branches will start about a third of the trunk height from the soil and will alternatively grow on two sides of the trunk with every third one to wards the back. These branches will gradually become shorter and thinner as you move towards the top or apex of the tree. The apex could be in-line with the nebari or base of the trunk. Finer branches are grouped to allow the leaves or needles to form “foliage clouds”. Empty spaces or the spaces between the branches will balance the tree to form a whole or one unit to look at. I am not too concerned about what other people think of my trees. I need to be moved or have an emotional reaction to a tree for it to make impact. I also do believe that it is this, the fact that a Bonsai tree can invoke a feeling, an emotional reaction, that makes it art. I also do believe that it is usually the simplicity in a design or form that triggers the higher emotion. Less is more. Wabi-sabi. Literati. The emotion of a trees that looks old, feels old, shows character, fits its pot and as a whole make you stand still and study it, is a piece of art. A lot of very complicated designs, excruciating bending, very heavy wire and at times heavy machinery (not really, just power tools), are used to get a tree to look like a Bonsai tree. Is this part of our instant generation? It has its place under the right conditions. I just wonder whether going back to the original simplistic view of Bonsai, the pure meaning behind the art form and taking a longer view or approach to the development of the tree, might not stir a stronger emotional reaction and make more people fall in love (also known as addiction) with this pure, simple and very rich art form. It is very common to see a photo of a seedling or small nursery stock on social media with the following comment: “I am new to Bonsai, please help with advice”. Where to start? What the follows is a number of people writing one liners or a bit more with a genuine interest to help. Unearth the topsoil to look at surface roots. Determine the front of the tree. Decide on a natural flow of the trunk dependent on the style envisaged. Decide which branches / side shoots to keep. Remove excess branches and foliage. Some of these can be selected for deadwood (jin). Wire main trunk if required. Bend trunk to desired shape. Each of these steps require a lot of knowledge to get to the end result. This is part of the conversation as the design unfolds. Small nursery material can take up to three hours to style with a new enthusiast in a workshop situation. The hands-on work takes only about thirty minutes to complete, but the explanations and answering of questions, in my mind the most important part, takes up a lot of time. This Juniper is nursery stock and is 20cm high from the top of the soil. It has been standing around here for a year or so and received very little attention. The first step is to scrape some of the soil away to see if there are any prominent, larger roots that can help to make a decision about the front / viewing side of the tree. In this case it only contained a whole lot of fine fibrous roots. It is therefore now up to the trunk line to give an indication of what could be a possible front. For newcomers, we usually look for good movement and flow. Once the best angle is determined to show things like flow and movement as well as taper or interesting features, it is marked and excess branches and foliage can be removed to reveal the trunk line. The conversation at this stage will include things like removing branches growing from the same height, branches on inside curves and crossing branches. Some of the branches are identified as possible deadwood branches and these are kept a bit longer. Bark is then removed. All of these steps have cleared the path for the trunk to be wired. Just the basic of wiring is explained and demonstrated at this stage as this skill is seen as a bit more advanced for a newbie. I think it is important to allow the person to start on their wiring pathway as it is an integral part of Bonsai design. As said, we stick to the basics at this point. It is more important to talk about design and flow at this point. The branches can now be wired. The next step is to place the branches in position while a conversation about safe bending takes place. Overall tree health is emphasized at all times. Once the placement is done, excess foliage, especially those growing downwards or upwards is removed. The concept of foliage pads is also touched upon. I find it is important to at this stage point things out like depth (back branches) and negative space. These are all explored ta more advanced workshops. The last part of the workshop is focused on future growth, the role on foliage in feeding the plant (photosynthesis) and then the very important aftercare of the tree. Protection of small buds and the removal of older foliage as the tree buds over the next few months is discussed as well as feeding requirements and protection over the next month or so. Potting, root management, carving, severe bending and more advanced wiring techniques are all part of more advanced techniques to be covered at advanced workshops. Quick Sunday afternoon styling job (small one). 15 cm from top of soil. Wiring, styling, jin work. 90 minutes. Apex will get more work done with potting to follow in Spring. This Juniper was lifted in June 2015 and planted in a plastic container. It came from a garden and was planted in a very sandy soil which came away during the lifting process. It was basically bare-rooted at the time which in my mind was not ideal at the time. I did bring some of the soil with me to add to the new mix with the hope that it contained some michoriza. At this stage I also removed some of the long, whippy branches with very little foliage on it to try and balance the foliage to root ratio. From this point on it was watered and fertilised and received plenty of sun. A few branches died over the next twelve months, but plenty of new growth showed as well. All of this was of the needle type and then reverted to adult growth. The tree was also planted into a Bonsai pot at which time the roots were reduced a bit. I had to move my trees three in the last six months. First from a colder, wetter part of New Zealand to an almost subtropical climate. The first place was a temporary place while we were shifting our household, then to a rental until we shifted into our own house three months later. Eighteen months after the lifting (January 2018) it was time for its first styling. Deadwood was created on the cut branches and then the wiring started. This took about six hours with not more than two hours done per day. I find it is best to start at the bottom of the tree and then work towards the apex of the tree. I have just used aluminium wire and varies from 1mm thickness to 4mm thickness. Quite a few guy wires were used to pull larger branches down. I use plastic tubing to protect the branches. Due to a few harsh bends, light cracks appeared and these were sealed with cut paste. Now it is time to let it rest. Water and fertilise, keep an eye on the wire to prevent it from cutting in give it plenty of sun. It could be show ready in about three years. The foliage pads must mature and I have left a bit of new growth on the main branch from where another branch or two can be formed to fill some gaps. Some of the Jin are too long, but I will leave it as it is for now. It is better to shorten them later. It is not that simple to make deadwood longer later. Lime Sulphur will also be applied later after some carving, burning and light sanding. I like to look at my trees from the top as I used to style very flat trees. Probably because I look at too many trees in photographs and this made my designs look very two dimensional and flat. From the top, it is easy to see the depth. You can do the same by looking at the tree from the side, but from the top you can also look for branches and foliage pads shadowing the ones below them. Demonstration at Fern Valley Bonsai Nursery: Part 5 of 5. Demonstration at Fernvalley Bonsai Nursery: Part 4 of 5. Demonstration at Fernvalley Bonsai Nursery: Part 3 of 5. What to do on a wintry day with the wind howling outside, rain bucketing down and more to come judging by the Ruahine Ranges covered in dark, ominous looking clouds? One idea is to cuddle up and get a good book out, another to get a hearty soup on the go, but the one that I gravitated towards, was to work on a nursery stock, small Chamaecyparis obtusa standing on my Bonsai bench. It has been there for more than a year now, just waiting for a day like today. The Chamaecyparis, also known as the Hinoki False Cypress, is native to Japan. It is a very slow growing tree and the nursery label on this little one states that it will grow to 60 cm high by 50 cm wide in 10 years. It has whorled branches of lovely dark green foliage and an upright habit with character and charm. Obviously not for long. Before I start, here is some more information on the Hinoki Cypress. The foliage consists of evergreen, fine scale-like leaves, dark and shiny green above (adaxial) with glaucous margins between scales which form a distinct “x” shaped pattern beneath (abaxial). This species is monocious with small male reddish brown cones and slightly larger female flowers which are round and yellow-green in color. It bears fruit in late summer, but these are quite small. The bark is gray and scaly with long furrows of reddish brown inner bark which peels in long, narrow strips. With this wind howling outside, I am going to let it influence my thinking and create a windswept (Fukinagashi) style shohin. I am sure that other styles will come to mind as I progress with this little tree. This is what I thought the front of the tree should be based on the Nebari. This is the view from the other side after a quick clean-up of the lower branches. The Nebari shows more prominent growth on the left hand side. This means that the tree could slant towards the right. With that in mind the leaves are removed from the smaller branch. The rest of the tree is cleaned-up by thinning out some of the foliage. At a slight slant to the right. This looks like a nice little tree already with the bark stripped off the smaller branch (Jinned) as well as a back branch and some other smaller branches. I could have stopped with the previous photo’s style, but wanted to style this in a Windswept style. Slightly more pronounced slant, more thinning and wired. The final product, all potted up and kept in a sheltered place. The size is 16 cm by 10 cm by 10 cm. Now it will be fertilized and watered regularly. Inspiration – where to get it from. It is said that a creative spirit needs inspiration. 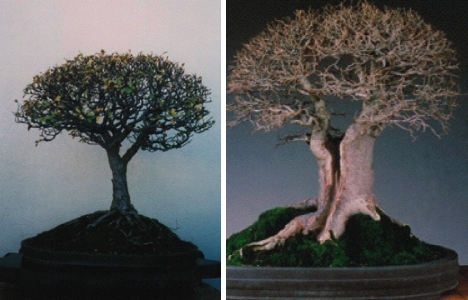 As Bonsai design is a creative activity, it is therefore important to be in touch with the sources of our inspiration. I have recently returned from a conference relating to Education where I was exposed to a variety of speakers. I was very aware that during and immediately after the conference, I was definitely more motivated to work on certain things in my main job. This came from listening to these powerful speakers and becoming aware of the latest trends in my vocation. This is the same for my Bonsai activities. Exposure to other Bonsai people will lead to higher levels of inspiration and motivation. I live in an area in New Zealand where there are not that many other Bonsai enthusiasts and you sometimes do feel isolated. To overcome this, I have to make an effort to meet up with other Bonsai people. The local club, although very small, serves as a source of inspiration. I am the teacher here and other people rely on me for the advancement of their skills and knowledge. This places me in a position where I have to stay on top of my game. Through this I have also realised that I only know about the tip of the iceberg and that I need to learn as well. Again it comes back to people, as I can only get this knowledge and skills from others who are more advanced than me, or have produced resources that I can learn from. So, first of all people. It is important that as a Bonsai artist, you realise that there will always be something new to learn or practice. I like the way that a lot of martial arts movements are set up. There is a clear line to follow from beginner level through to a very advanced level. I am not saying that we have to start different colour belts to show our proficiency in Bonsai, but the levels of training can be copied. A sensei at one dojo always learns from a more advanced practitioner somewhere else. This means you either have to go places or you have to get the masters to your place. This is already happening in Bonsai throughout the world and this has opened up many more opportunities for Bonsai professionals. As a side note, I do use the term Bonsai professional in a different context to Bonsai master. Not all professionals are masters and not all masters are professionals. More on this in later blogs. Back to the main thread of this blog. Where do we get inspiration from to excell in Bonsai activities? I have already established that it is mainly through the exposure to other people and preferably to more advanced practitioners. That means that you have to be a regular club member, be active in this club and teach at that level. The next step is to align yourself to an organisation or club where more advanced teaching takes place. From there it is important to attend shows, regional and national and even international teaching opportunities. Displaying your own trees is a big part of this. Immense growth takes place when you receive feedback from visiting judges once you get over the fact that you might get some negative input as well. Good teachers will make sure that this feedback is constructive and you can learn much from that. Just leave your ego at the door when you go into this type of situation, after-all, there is no ego in Bonsai as an art form. Other forms of inspiration comes from man made resources. I find a lot of inspiration in my very large Bonsai library (wonder what the total cost of this is), which consists of books and many magazines. I currently hold a subscription to two international magazines and also receive our national production on a regular basis. Books come through online bookshops and I am now also in the fortunate position that I receive books from publishers and authors to review. Magazines keep me up to date with what is happening in the Bonsai world and brings the latest shows into my living room. My next source of inspiration comes through good blogs. I follow about 25 blogs and find them informative and a major part of my everyday learning. My own education has increased immensely once I started my own blog (this one) up. I have to research every topic as there are always people out there who will catch you out if you talk nonsense. Try it, not the catching out bit or the talking nonsense bit, but the blogging bit. I also regularly visit websites dedicated to Bonsai activities and other related topics (suiseki and general horticulture). Then there is You Tube. What a great learning tool. Here I am subscribed to at least thirty good quality channels and people who regularly post new material and from which I learn heaps. Just type Bonsai in the search area and you will find a great resources at your fingertips. While I am on internet based things, Facebook is exploding around Bonsai matters (probably lots of other things as well). One needs to be disciplined when you venture into this mosh pit of activity. Not everyone who has a presence here are noteworthy, but most of the “big” names in Bonsai are represented here. I am very sure that there are many more sources of inspiration for Bonsai activities and I also know that what works for one person, does not necessarily work for everyone. The bottom line is that you cannot venture on this Bonsai journey on your own. You need other dedicated people around you and always be aware of the one-up principle, you need to learn and be inspired by people or a person who knows more than what you do. Then there are my own trees. The moment I start to spend time with my trees (and the trees of other people), my motivation levels rise and there is no substitute for it. Yes, it can lead to frustration if you do not get it right, but overall it is invigorating and inspiring when you work with trees and realise the progress. Surrounding you with good people, good resources and good trees will always expose you to enough resources to keep going and to keep going at a high level. 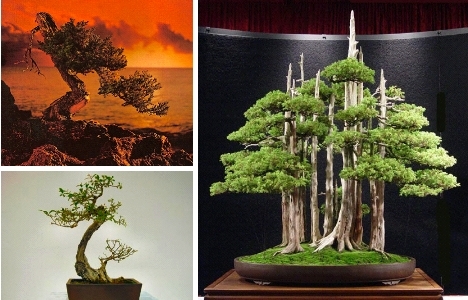 There is no doubt that Bonsai is a Creative Art form. Once the horticultural needs of the plant is met, the creative and art side of Bonsai kicks in. In thinking about this concept of creativity and how it applies to Bonsai, I had a lateral thought moment that it is not dissimilar to what Maslow proposed as the hierarchical needs of human beings. The major difference is that we do not work with an organism that can think when it comes to Bonsai. The lowest level of needs around the Biological and Physiological must be met for the tree to stay alive and the next levels applies to us and not the tree. Higher levels of Maslow’s theory do refer to the need for creativity and maybe through that, a level of self-actualisation for us as humans. There is a need for us to be creative. Not all of us are in touch with our creative sides. Mine came late. I realised that I could grow things, that I am good at educating people and once I was exposed to the Art of Bonsai, I found an area where I could feed this need to be creative and become involved in another where I could educate and be educated. It is the process of having original ideas that have value – Sir Ken Robinson. The phenomenon whereby something new is created which has some kind of value – Wikipedia (probably not a guru). Micheal Gelb suggests that for original ideas to provide value, they must be translated into action. He also refers to the term “creative energy”. How can we apply this to Bonsai? I see three movements in the Bonsai world. The one is the creation of Penjing – landscape scenes mainly out of China. Another one is the following of the rules and “laws” of the traditional Japanese style and the third one, which is growing rapidly throughout the West, a more informal, creative style. Whatever path you take, creativity is needed to pursue it successfully. Sir Ken Robinson’s idea of having original ideas probably leans itself more to the more informal style as one is not necessarily bound by the “rules”. Although I have made a thorough study of both Penjing and traditional Bonsai, I find that I do lean towards a more informal, creative style. Why? It could be that it suits my way of thinking or it could be that the material I have available to work with, leans itself more towards it. 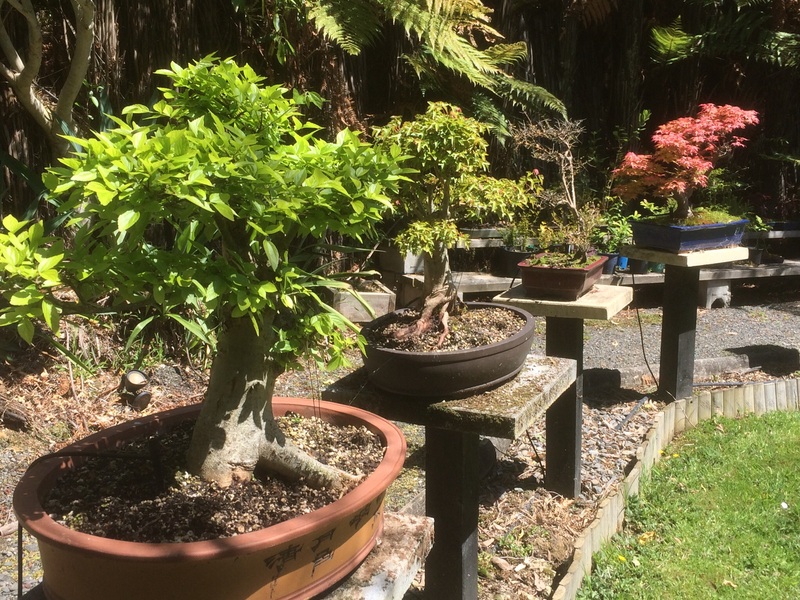 The New Zealand Bonsai scene is relatively young compared to the rest of the world and we are bound by regulations through which we cannot import trees and have to rely on what is already here and then work according to what these trees allow us to do. Is this a problem? No, I do not think so. I just had the privilege of helping to select the trees that will be on display at the National Convention later this year in Christchurch. The trees put forward for selection are of good quality and very dissimilar to each other. The variety tells me that there is a creative spirit or energy (Gelb) present. The lesson that I get out of this is that once we throw the shackles of conformity and “rules” off, creativity is enhanced. This is seen throughout the world. I am not saying that the rules and the foundations of Bonsai must be thrown away, what I am saying is that it is clear that where people have the opportunity to be more creative through what the tree allows us to do, the results are as spectacular as when we follow the traditional rules. It is fascinating watching our best Bonsai creators in action and studying their creations. Even the ones with a thorough traditional Japanese grounding show that you have to respect the tree and when we especially work with wild harvested material (Yamadori), the tree’s history must be respected in the design. What does this mean for our creativity? You have to let the tree lead you, but within that you still have options. Some of these options will include the following of traditional “rules”, but where the tree does not allow this, one will have to apply original ideas (back to Sir Ken) and if this leads to a well-designed Bonsai tree, then creativity is seen in action. It has value as it has added to a body of knowledge, ideas and even new techniques that could be used in future. I can use the composition of Music as an example. The composer needs knowledge, technique and an open mind to compose. The composer would have studied Music, played it, composed it, made mistakes and would have experienced success. The same is valid for Bonsai creation. Study what is available, practice a lot, work on minor trees and work on superior material as well, but above all, ensure that you have an open mind. What does the tree allow you to do? How do you use that to create beauty? Do you have original ideas? Do you add value? My last thought for today: Look outside of Bonsai for inspiration. Read and use You Tube to learn about other creative pursuits and let these inspire you to be even more creative. Creativity on demand by Michael J. Gelb. A great read for general creative inspiration. Creative Schools by Sir Ken Robinson. I am an education leader (something has to pay for my Bonsai addiction) and find that I can apply ideas from all over to my recreational and creative pursuits. Wikipedia. It always gives me a heads-up when I start to wonder about things. I apologise if I have broken rules to use them here, but all I am trying to do is to promote Bonsai in general and certainly not for my own gain. I have recently seen a poster depicting five general Japanese Design Concepts (www.piktochart.com) and it started to make me think about how these concepts are utilised in the design of Bonsai. These concepts are Wabi-Sabi, Iki, Ma, Mono-No-Aware and Kaketsu. This concept is the one that is quite often discussed in Bonsai literature. To find the exact meaning of this is quite difficult and as a non-Japanese speaker, I have to rely on definitions and descriptions from the literature. It is quite clear that there is a wide variety of interpretations of what it exactly means and the literature acknowledges this fact. A concise summary of a possible meaning is that it is a Japanese world view or aesthetic centered on the acceptance of transience and imperfection (en.m.wikipedia.org/wiki/Wabi-sabi). It is the art of finding beauty in imperfection and profundity in earthiness, of revering authenticity above all (www.utne.com). Susuma Nakamura (Neff, 2012) relates wabi to calmness and quietness and sabi to simplicity and oldness (age). Morten Albek (shohin-europe.com) describes it best in relation to Bonsai. He summarises it as a concept embracing beauty, simplicity, silence, age and imperfectness. In my mind it is that quietness that embraces one when you look at a Bonsai and it brings a stillness and a peacefulness, and at the same time a restlessness due to imperfections that add to the overall beauty of the living artwork. This can be seen in a rustic pot, the naturalness of the tree, not all branches or roots being in the perfect spot, the power exuded by a tree due to its age. It gives a sense of balance between perfection and imperfection with a deep appreciation of nature and the art depicted in that tree. That balance could be observed as a perfectly formed branch and on the trunk a shari. Perfection vs imperfection that all adds up in a deeply satisfying experience of interaction with this tree. It is the calmness and quietness embraced when in the presence of a Bonsai tree showing simplicity and character. According to the poster mentioned, it means original, calm, exquisite and sophisticated, but without being perfect or complicated. A rough translation means chic or stylish. This is a term not found in Bonsai literature as it probably is encapsulated in the Wabi Sabi concept. It could mean the design of a Bonsai should be original, in other words, to allow the tree to determine the design, not to copy other trees, but to allow the roots, trunk and branches to dictate the style and movement of the Bonsai. If naturalness is pursued, it should lead to an exquisite and sophisticated tree. This probably will only be seen in mature trees, but is a concept that must be kept in mind during the design phases, spreading across years to reach the ultimate phase where the exquisite nature can be experienced. This concept refers to whitespace or emptiness. It defines the element around it and it in turn also is defined by the element surrounding it. The concept of holism comes to mind here. An empty space cannot be defined as such without something bordering it. The design element of empty spaces is a very important one in Bonsai design. The description of creating spaces that will allow a bird to fly through the tree, brings the example of especially Tui that can fly without effort through a tree, to mind. Emptiness or negative space defines the solid structures around it. It is part of the design. We are sometimes so fixated by getting a branch in the right place in relation to the trunk and other branches, that we forget that the branch is not only defined by these structures, but also its own shape in relation to the space around it. Foliage clouds can only be defined when there is open space around them. The size and placement of these spaces is as important as where the parts of the trees are placed. This concept refers to the “pathos of things”. It means being aware of the passing of things and the bittersweet feeling that goes with it. This is very noticeable in Bonsai. A Bonsai tree starts somewhere, either from seed, a cutting or wild material. From here it is nurtured, neglected, designed, restyled, appreciated and it could die (hopefully outlasting its designer). It goes through phases, each with its own characteristics, much like a human being developing from birth to old age. As humans we have empathy and we can admire this development. The same happens with Bonsai. “Before and after” photos are popular and personally I think it is awesome to visit Bonsai gardens, displays and conventions to look at the development of individual trees over years. This concept also relates to the impermanence of things. The flowering phase that in some species only last for a few days, also seen in deciduous trees and the changes that go with that. From no leaves, to green leaves, to autumnal colours to no leaves again. These changes should be embraced and studied as they are forced by nature and hormones. It also gives us the science behind the horticultural management of our trees. Nature is never very far away from art. This concept stresses that true simplicity is often achieved through a complex process. The opposite of simplicity is complexity. This design concept therefore means that to create a “final” design of simplicity it is possible that complex processes could be used to achieve this ultimate goal. 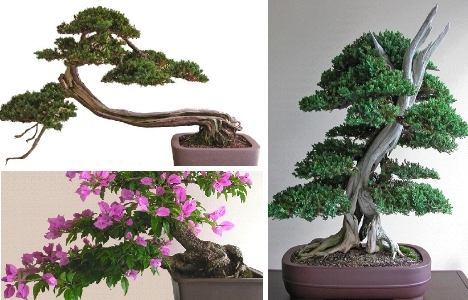 To achieve simplicity in Bonsai design, it is important to be as naturalistic as possible. The complexity in the process lies in decision-making. What to cut, what to shift, what to leave in place? The answers to these questions will ultimately determine the design and whether it is simplistic or complicated. A tree in nature is simplistic; roots, trunk, branches and leaves, all in place due to nature following a simple pattern. There are external influences (climate), but overall it is quite a simple design. The processes of getting it there is complex, photosynthesis to name but one. Overall this concept urges us to keep our designs simple, to look at nature for inspiration and to follow the mantra of “less is more”. This article very briefly describes five Japanese design concepts. There are many more. The concept of Wabi Sabi is well known in Bonsai circles, but the others are not so much known in the western world. The concepts are not new, but it is good to know that they are actually known and acknowledged in wider design and artistic circles. 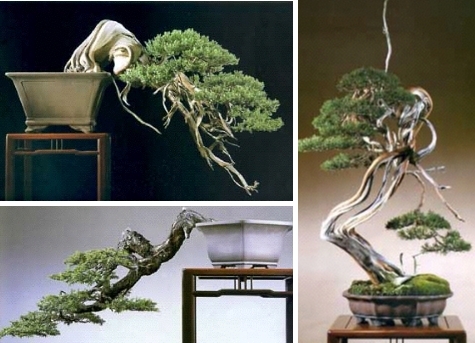 As said, there are other concepts or qualities that can be applied to Bonsai. One of these, “ga”, meaning elegant and graceful, is proposed by Susumu Nakamura. He also says that such watchwords can sustain the caretaker as well as the tree (Neff, 2012). The Stanford Encyclopedia of Philosophy describes Japanese Aesthetics. It is my recommendation that all Bonsai enthusiasts should read this work as it gives a deeper foundation of what Bonsai design should be based on. The link is http://plato.stanford.edu/entries/japanese-aesthetics/. Neff. T.A. (ed) 2012. Bonsai, A Patient Art. The Bonsai Collection of the Chicago Botanic Garden. Yale University Press: New Haven. Online magazine for beginners and experts. The struggles and smiles of a 30 year old.